The Aptera is another three wheeled electric car that will be technically classified as a motorcycle once it hits the road. The vehicle will come in two models, the Typ-1e and the Typ-1h, an all electric model and a hybrid model respectively. The electric version will be able to travel 120 miles on a charge and accelerate from 0-60 in 10 seconds with a top speed of around 85 mph. 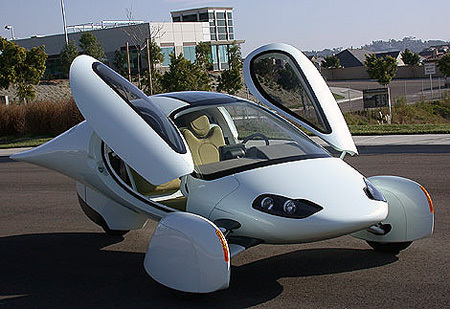 Not as fast as it looks, but at $27K for the electric and $30K for the hybrid, the Aptera is a worthwhile investment if you want a head turner that saves the environment as well as your gas fund. The Aptera seats two comfortably and is safer than it looks according to the Aptera site, where you can reserve your own Typ-1e for $500 down. Production will start in late 2008.